The new building in Dudley Square in Boston doesn’t look like anything else in sight. And yet it fits right in. That’s a good description of the tempered ambition of many American urban projects opening in the coming months: They aren’t disruptive but (their supporters hope) transformative, and their shapes, even their sparkle, come from understanding past civic hopes and redesigning them to meet the future. 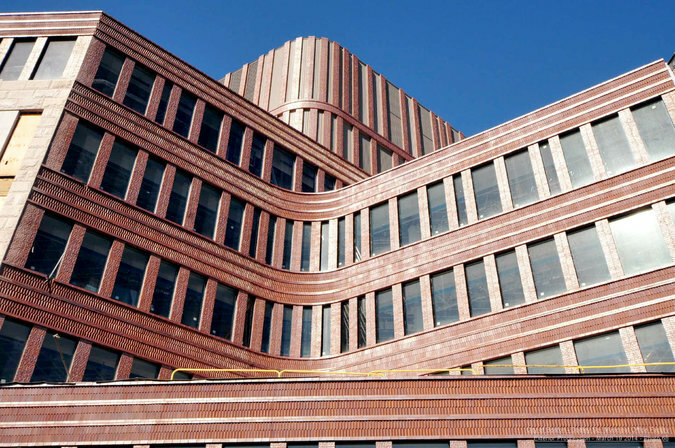 The curvaceous brick cornice of the Bruce C. Bolling Municipal Building in Dudley Square knits together three historic buildings, provides offices for 500 employees of the Boston Public Schools and incorporates an old rail track into its ground-floor plan, the better to connect the building to the adjacent bus station. The building’s striking design, by Mecanoo Architecten and Sasaki Associates Inc., is a literal beacon (the mechanical penthouse has nighttime lighting) as well as a metaphorical one, signaling the city’s reinvestment in an area where community groups fought off a highway and organized land trusts to create affordable housing, schools and gardens on vacant land. The new building does not seem parachuted in, but inflects to the existing fabric, taking its curves not from the computer but from the distinctive round corner of the 1895 Ferdinand building. The Bolling building fits a new category of what one might call strategic architecture: projects that combine the forces of community activism and historic preservation with government muscle, encourage future development through eye-catching design, and link to the parks, plazas, bike paths and libraries that give neighborhoods a center. These are hybrids, not large-scale institutions like museums but urban players, being built in places not necessarily known for design. They will open new routes through old cities and new ideas about what businesses can be successful in which locations. The idea that urban planning could build upon citizen action, rather than consisting of imposed boulevards or housing blocks (as with the urban renewal that originally gutted Roxbury) is gaining traction. 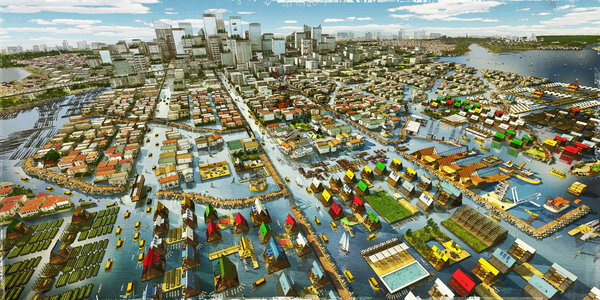 The Museum of Modern Art, which has exhibited its fair share of top-down architectural proposals, amplifies that conversation with “Uneven Growth: Tactical Urbanisms for Expanding Megacities” opening Nov. 22. The museum asked six interdisciplinary teams to devise new strategies to deal with environmental, spatial, and residential challenges in six of the world’s cities, often learning from informal, smaller-scale design that residents have accomplished on their own. Theaster Gates, the Chicago artist and planner who gave a keynote speech at this summer’s American Institute of Architects national convention, has recently offered a twist on bottom-up efforts at revitalization. Over the past few years, Mr. Gates and his nonprofit have renovated buildings on the South Side, creating housing and small-scale cultural facilities with a distinctive aesthetic of reused, patchworklike building materials. His most ambitious project, the Stony Island Arts Bank, will open next spring, transforming an abandoned 1920s terra-cotta-clad bank Mr. Gates bought from the city for $1 into a gallery, restaurant and reading room, stocked with the library of John H. Johnson (founder of Ebony and Jet magazines). For Mr. Gates’s social project to succeed, the programming is as important as the paneling, and the bank has already been selected as a site for the first Chicago Architecture Biennial, opening October 2015. In downtown Durham, N.C., a 17-story Art Deco bank designed by Shreve, Lamb & Harmon, architects of the Empire State Building, will reopen as an art and entertainment hub in February 2015, the latest in the chain known as 21c Museum Hotels. The company picked Durham to follow Louisville, Cincinnati and Bentonville, Ark., because of existing revitalization: the redevelopment of the city’s defunct tobacco factories, the thriving food culture, the local start-ups. The adaptive reuse of the bank will combine a boutique hotel and gallery, with rooms in the tower above site-specific art installations, a restaurant, ballroom and a spa tucked into the former bank vault. All the hotels in the chain were designed by Deborah Berke Partners. Libraries have proved a building block for neighborhood change in Washington, where the public library system built and renovated 14 new branches under its former director Ginnie Cooper. The latest neighborhood to get an elegant new library is Woodridge: A lanternlike, precast concrete building with green roof terrace by Bing Thom Architects and Wiencek & Associates is set on a rise in Langdon Park and due to open in mid-2015. Branch libraries are also a focus for the Architectural League of New York and the Center for the Urban Future, which commissioned five teams to study the design challenges faced by libraries as they become both digital and physical hubs. Results will be presented in December. The Ryerson University Student Learning Center in Toronto by Snohetta is another library with urban ambitions. The building, to open in early 2015, looks like a gem on stilts, with a bridge to the historic building where the books are kept. The ground floor on busy Yonge Street will have retail shops; around the corner, on pedestrian-heavy Gould Street, a set of steps and mirrorlike triangulated canopy invite students and the public into an open lobby. In Houston, Lake/Flato Architects, known for their pitched-roof, ranch-inflected modernism, are transforming the 1910 Sunset Coffee Building into a boat- and bike-rental shop, a second-floor cafe and offices for the Buffalo Bayou Partnership at the site of the city’s first port. The $5.3 million project will provide a hub for larger urban projects that link up at the site: the light-rail line that connects the University of Houston-Downtown campus to the museum district, the city’s historic district and the sprawling 160-acre Buffalo Bayou Park itself. A new park segment, designed by SWA Group, will also open in the spring, allowing for a continuous trail from the Coffee Building to downtown’s western edge, some of it navigable by kayak. When a section of the earthquake-damaged Central Freeway came down in San Francisco, local advocates saw a chance to create a template for a stronger neighborhood. 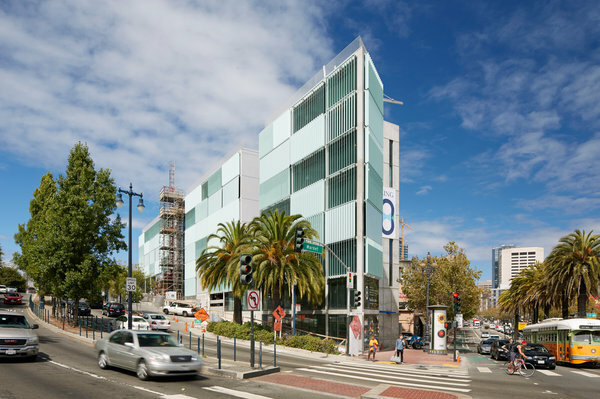 Buildings along the newly created Octavia Boulevard by several architect-developer teams include retail and affordable housing, and take advantage of the area’s walkability and public transportation. Their design does not mimic historical architecture but offers distinctive character: contemporary, delicate in its details, referring to San Francisco Victorian bays and pastels without imitating them. The newest, 8 Octavia, an eight-story condominium by Stanley Saitowitz/Natoma Architects, opening this month, has a facade of operable, white louvers, making a changing pattern across the simple surface and a virtue of its long, narrow site. Transportation is at the heart of many cities’ strategies, as planners focus on life beyond the automobile. The Anaheim Regional Transportation Intermodal Center is a new station where 10,000 passengers can board eight different transportation modes daily. It will open in Orange County in November under a retro-futurist parabolic roof formed by polymer pillows (the material used for the Water Cube at the 2008 Beijing Olympics). Its designers, Parsons Brinckerhoff and HOK, with SWA Group as landscape architects, created paired plazas: one beneath the roof, one under a canopy of trees. Los Angeles’s elegant 1939 Union Station is also getting a face-lift to accommodate more foot, bicycle and bus and rail traffic, as well as the long-awaited high-speed train. Will architecture make people get out of their cars? Read books? Explore new neighborhoods? When it makes personal connections, yes.